The TrackMaster Motorized Railway is your track to action and adventure, with complete track layouts, motorized engines, stations and more! With TrackMaster, motorized engines provide the action while the child’s imagination fuels the adventure! There's a lot to do on the Island of Sodor! Thomas chugs around the track. Flip the switch to stop Thomas at the station platform to make his deliveries! It’s the perfect way for children to bring the world of Thomas to life... and the perfect introduction to TrackMaster! 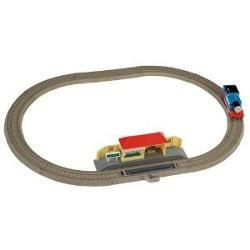 Includes motorized Thomas, complete track layout and train station.